The Faculty of Dentistry was formally established at the Medical University of Budapest (now Semmelweis University) in 1955 by Professor Károly Balogh, who served as its first dean. 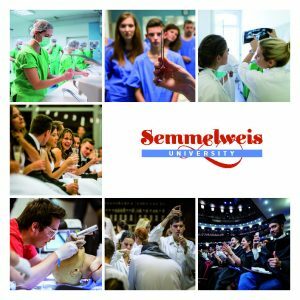 The Faculty educates more dentists each year than all three other Hungarian dental schools combined; over two-thirds of practicing dentists in Hungary received their diploma and professional specialty training at Semmelweis University’s Faculty of Dentistry. The current dean is Dr. Gábor Gerber, D.M.D., Ph.D.
Six of the Faculty’s eight departments are located in the Dental Clinical and Training Centre, one of the most state-of-the-art dental institutes in Europe. With its 12,000 square metres of floor space and 172 dental work stations, it provides an ideal facility and conditions for both undergraduate and postgraduate training and clinical research. The Department of Oro-Maxillofacial Surgery and Stomatology is located in a separate building that has recently been refurbished and rebuilt and completed with a new floor giving room for a new inpatient ward with a 25-bed capacity, as well as a fully equipped operation theatre suitable for major head and neck surgeries under general anesthesia. The Faculty’s theoretical department, namely the Department of Oral Biology located in the NET, the Faculty of Medicine’s Theoretical Building at Nagyvárad tér. The Faculty offers academic programmes at undergraduate, postgraduate and Ph.D. levels. Its dentistry training programme, which results in a Doctor of Dental Medicine (D.M.D.) degree is available in three languages: Hungarian, English and German. Each year, 95-100 first-year Hungarian students begin their studies at the Faculty, while there are a total of 70-80 foreign students enrolled in the English and German language programmes every year. The total number of dental students studying at the Faculty is nearly 800. The Dental Faculty has 100 full and part time professors and tutors. The major theoretical and clinical subjects are taught by the Faculty of Medicine. The Faculty of Dentistry has an accredited Ph.D. program called Research in the Dental Sciences. The Faculty’s health care activities primarily serve the education of our dental students; nevertheless, the faculty members are also specialists of their own professions, while the Faculty’s practice serves the whole of Hungary, providing comprehensive dental care for those referred to the clinics by family dentists or other medical institutions. 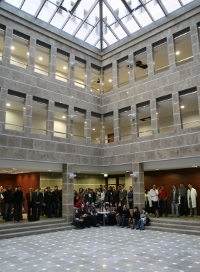 The Faculty’s main field of research activities are: biomaterials; nanotechnonolgy; dental and periodontal epidemiology; gingival and pulp microcirculation; experimental gingivitis; salivary gland physiology; stem cells of pulpal and periodontal origin; membrane transports and signaling mechanisms; guided periodontal and bone regeneration; genetic polymorphism and periodontal disease; genetic polymorphism and tooth aplasia; complex therapy for oral cancer; three-dimensional tomography; the biological role of nitrogen monoxide. The Faculty has many scientific collaborations with nearly all European countries, as well as numerous Institutes from the U.S. Many of the senior faculty members are actively involved in international dental societies and are on the editorial boards of several international journals.